AddictiveJewelry | Baby Baptism Jewelry, First Communion Jewelry, Confirmation, Personalized Rosaries, Personalized Religious Jewelry, Inspirational Jewelry, Mothers Bracelets, Grandmother Bracelets, Name Bracelets - Tiger Eye Personalized Rosary - Great for Boys! Tiger Eye Personalized Rosary - Great for Boys! 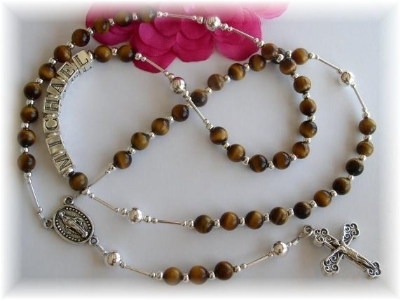 This attractive�rosary is created with 6mm golden Tiger Eye stones and sterling silver accents.��� A favorite choice�as a First Communion, Confirmation or Graduation�gift for�boys.� Beautiful plain ($90.00), or make it extra special with personalization! This attractive rosary created with 6mm golden Tiger Eye stones and sterling silver accents is a favorite choice as a First Communion, Confirmation or Graduation gift for boys. It is handsome plain, but why not make it extra special with personalization!